How about your mom? What’s something wonderful and/or unique about her? Does she know you admire or appreciate it? To see more answers and post your own, watch our 2 minute VIDEO on this. 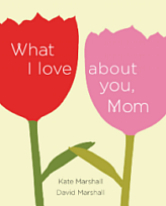 This entry was posted in Family Stories, Relationships, What I Love About You Mom and tagged love, moms, mother-child, mothers, parenthood on April 2, 2013 by Marshall Books.